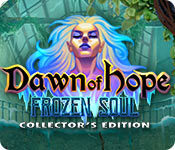 Dawn of Hope: The Frozen Soul Collector's Edition is rated 3.7 out of 5 by 19. Rated 5 out of 5 by biscuitsmama from THE FROZEN SOUL BRINGS BACK THE EXCITEMENT OF SKYLINE ADVENTURE Dawn of Hope The Frozen Soul is the third game in this series. I loved the first game as it was something different with an excellent storyline. Unfortunately, at least for me, the second game Daughter of Thunder did not hold that same feeling of excitement that I experienced with the original. When the beta for The Frozen Soul was released months ago, I tried it but for some reason I found it rather boring and I wasn’t too sure that I wanted to bother with the full game. When the game was released today I decided to try the beta and within a short time I was hooked. This game is much more than I expected and it seems even better than Skyline Adventure. The storyline picks up years after Skyline Adventure ended and is more of a continuation of that first great game. What I enjoyed the most in this game, aside from the storyline, were the HOPS. It seemed like there were far more HOP scenes than there were puzzles. I enjoyed getting back to a game where I could play a lot of HOP scenes rather than having to solve a puzzle to make any progress in the game. The HOPS did include a variety of styles but there were far more list type scenes which made me one happy gamer. 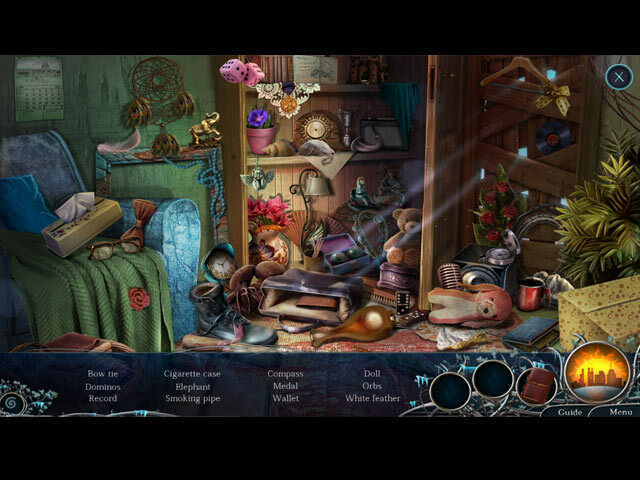 I began playing HOPA games way back when because I love searching for the items. Although we do have a tech tool that requires solving a mini-puzzle before it can be used. I rather enjoyed that type of puzzle so it didn’t bother me at all. Perhaps a year or two ago there was a huge clamoring for more puzzles in HOPA games and BFG listened so every game eventually became so puzzle heavy that we could make no forward progress in a game without solving a puzzle. It got to the point where I actually cringed because, oh yes, there was another puzzle to solve. Although I enjoy puzzles, I do like balance in a game and it got to the point where the games were becoming too predictable and no longer fun. Fortunately, I am so happy that the Mad Head team decided to move back to the roots of the HOPA genre and included wonderful HOPS in this game. Thank you Mad Head and BFG for taking a step back to what made the HOPA games wonderful and fun for many of us in the past. I’m not going to go into more detail and will simply tell you that I loved this game. Perhaps it is we get to meet old friends from the previous two games and work with them to rectify the great damage caused by the betrayal of a trusted mentor and friend. Will you be able to stop Queen Alyssandra who is bent on revenge and destruction of the human race and all who will help them? You will find the answer to that question as you play this terrific new Dawn of Hope game. As always, please try the demo to see if Dawn of Hope The Frozen Soul is a game you will enjoy. Happy gaming! Rated 5 out of 5 by Ndwelt from Best line: "At least it's not a crystal or an amulet" Love post-apocalyptic stories. Hhm I may be crazy after all. Ruled by the Elites. Almost sounds familiar. This is a great story with believable characters and voices. I just started the demo and find myself enthralled already. Although I did pause to write this review because when a game is AWESOME at the very beginning you know it's a winner. MadHead, is a favorite developer because of their creativity and innovative writing. I hope you all enjoy this as much as I do. Rated 5 out of 5 by rainworm from Llsten to Mr Hett's story...... As other games of the series, the Frozen Soul is a hybrid between fantasy and sci-fi, in my impression, both elements are more woven into each other here. A human and an elf are using technology of the 20th century, described as old, to achieve goals but we have elven fae magic as well in use – an altogether new idea to blow the dust from cliché fantasy/sci-fi features. The introduction shows Mr. Hett. He tells children the story of how people of the past failed in their environment and destroyed it. When life was almost impossible, the elves came and restored what had been destroyed. Piece by piece, we will learn, mankind lives in a dictatorship in which an elite of men, the so-called society, is in charge. It rules with an iron hand and uses high technology and supernatural means to keep the people quiet and prevent rebellion. We meet Mr. Hett again, as a leader of the rebels. He is speaking to his followers and calls them to resistance, when a supernatural snowstorm breaks up the congregation. But the mission is clear: they want to put an end to the tyranny by liberating the imprisoned Elven Queen. As the elves once saved mankind, she seems the only one, able to overcome the hostile forces. The human girl Tara and young elf Lennart are chosen to locate and free her. However, the logic of two, having the same enemy, form a natural alliance against him, won’t come true that easily: After her long captivity, the Elven Queen is obsessed with vengeance. Impressing graphics of a postapocalyptic and a fantasy world forms the scenery for a fast paced game. We have many puzzles, variable in design and challenge but all fun to play! HOS are presented in varied styles as well, everyone spiced with a morph. Morphs and collectables are of course in all scenes. For me the best in the series so far! Rated 5 out of 5 by sunnyglow from WELCOME TO A “HOT” NEW GAME SET IN A “FROZEN” POST-APOCALYPTIC WORLD REVIEW BASED ON THE ENTIRE GAME: 5 Chapters plus a Bonus Chapter – Strategy Guide: 46 Pages – Time: 6-1/2 Hours OVERVIEW/BACKGROUND: Welcome to a post-apocalyptic world – the decaying relic of a technologically advanced civilization. Travel to the village of Spite, the seat of the rebellion against the Society, the governing group of this world. Play Tara, who, along with sidekick, Lennart, are young rebels under the tutelage of the village elder, Mr. Hett. When an Artic blast descends upon the village, freezing everything and everyone, the Society is blamed for using climate control as a weapon against their subjects. Under the instructions of Mr. Hett, Tara and Lennart are off to Mount Nucleus to find the only entity who can stop the Society, the Elven queen, Alyssandra. However, she has been imprisoned by the Society, and freeing her will be a challenge. Get prepared for an arduous journey, with many surprises awaiting you in this game. Be warned - not everything is as it appears in this frozen world! OPINION: This is another great sci-fi game by Mad Head. It is a long game, and one I felt was worth every penny! It is a sequel from the previous games in the series. Some of the characters make an encore appearance in this game. It is a puzzle-lover’s dream. The graphics provide an excellent portrayal of a post-apocalyptic world. I love the story behind the game with a plot with many twists and turns. It is a fast-paced adventure game with plenty of activities to keep the player engaged. MECHANICS: There are five levels of play including a customized version. There are eleven (11) achievements, most with three (3) parts. There are twenty-seven (27) snowflakes and twenty-seven (27) morphing objects to collect within the scenes of game. There are also another twenty-one (21) morphing objects to collect within the HOP scenes. Most are easy to locate. There is an indicator bar to indicate whether you have located all the collectibles within the scene. You can replay twenty-one (21) HOP scenes. There are four (4) wallpapers plus the usual concept art and soundtracks. GIMMICKY MICROWAVE FREEZER! Your helper in the game is a device which heats and freezes items. I found it a strange device for this game – rather like a microwave oven with a mini-ice maker attached. I hate gimmicks within games. I feel this one was unnecessary, and to me detracted from the game. BONUS CHAPTER: It is a sequel. Play Melua, who is off to rescue the Elven Queen Alyssandra, when she is kidnapped by Lord Krieg of the Claw Clan. I like the activities but not the story behind this game. I also did not like the gimmicky healing Treeheart, which is used extensively in the first part of the chapter. 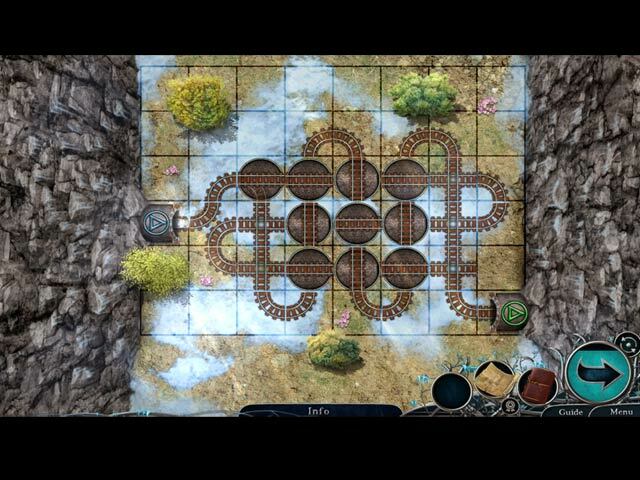 However, there are some creatively designed HOP scenes and puzzles within this chapter. HOP SCENES: There are twenty-five (25) in the entire game. However, that includes four (4) mini-HOP scenes which are FROGS in which you collect a small number of pieces to create an inventory item. All the standard scenes have morphing objects. Most of the scenes are lists of items with basic junkpiles of items to locate. However, there are a few silhouette scenes and storybook scenes as well. Some of the scenes are creatively designed and some of the scenes are reused. My favorite scenes are in the bonus chapter. There is one in which you rotate a stone circle to locate the items. Another scene in that chapter has a search for items in a dark room using a flashlight. PUZZLES: This game is puzzle-intense. WOW! There are forty-seven (47) puzzles in this game. The puzzles vary in design and difficulty. However, I did not find any of the puzzles challenging; most of the puzzles are easy with a few of middle difficulty. There are quite a few sequence puzzles in this game along with battle scene puzzles which require some type of physical activity. Mad Head - PLEASE provide a replay of the puzzles within your games. There are many fantastic puzzles and I, for one, would rather replay a puzzle than a HOP scene. MICROWAVE-FREEZER DEVICE PUZZLE: Each time you use the gimmicky device you must play a variation of a skipping stones puzzle. You must remove colored blocks from a grid by connecting two or more of those blocks to remove them. You must remove all blocks. The puzzles increase in difficulty as you proceed in the game. This device is used ten (10) times in the main game. It is NOT used in the bonus chapter. SPOILER: There are 47 puzzles in this game; however, here are a sampling of a few puzzles AFTER the demo: A. Simon Says puzzle. Repeat a given sequence on bricks with symbols upon them. B. Logic puzzle. Wound the evildoer. For a gun choose (1) the right amount of gun powder and (2) the correct angle - then (3) shoot C. Battleship puzzle. Place tokens on a grid with landmines. Open the squares on the grid until the only unopened ones are the landmines. If you land on a landmine, you must restart the puzzle. BONUS CHAPTER PUZZLES D. Maze puzzle. Move lock and key figures on stones so they connect with each other. Use arrows at the side to blow air to move them. 3X E. Sliding tiles puzzle. Slide tiles to their proper location. However, this requires logic as you cannot move over tiles which have already been placed. F. Assembly puzzle. Find symbolic pieces which, when combined, equal a given symbol. 3X G. Mathematical puzzle. On a 3 x 3 grid move tiles containing from one to four tokens upon them so that the number of tokens are the same for each row, column and diagonal of the grid. Rated 4 out of 5 by charlene_lane from ALYSSANDRA - FRIEND OR FOE? REVIEW OF COMPLETED GAME AND BONUS This is the third game in the series and its quite good. There are: * Voiceovers (with dialogue)' * Seeker, Adept, Master, Secret Master and Alchemist modes; * Interactive map; * Journal; * 11 Achievements (some with 3 circles); * Find 27 snow flakes and 48 morphs throughout game and bonus; * Replayable HOPs. The graphics are gorgeous and well defined. Colours are muted and not harsh or garish. The music is mainly orchestral and piano. 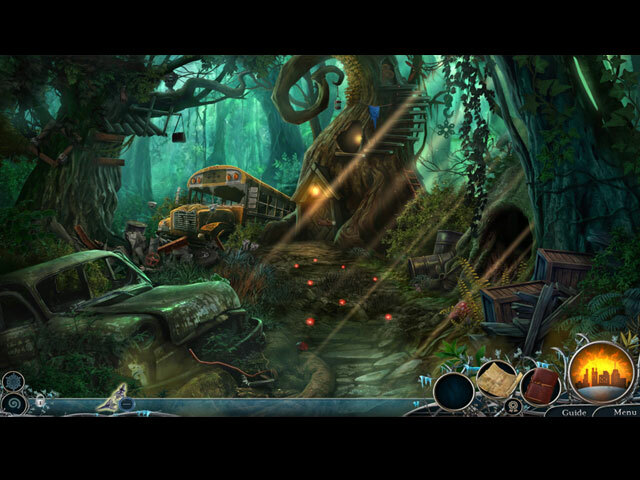 The hidden object games are mainly straightforward and silhouette. These are easy to do because items are clear to see. Just keep an eye out for that ever elusive morph in each HOP. This time I didn't make it with 3 stars for every HOP because a couple took quite a long time with rotating arrows and I took too long to find the items. However, I just made sure I got 100% (without errors) which I suppose is good enough. I liked the mini-games. Most of them are easy, but a couple were quite challenging - like the mine game. I ended up drawing the grid on paper and then eliminating each single grid until I knew where all the bombs were. I enjoyed this. There is a device you will use throughout the main game which heats or cools items. You need to do a simple mini-game before you can use it. I found this irritating after a while because its the same mini-game over and over again. I wish there had been some deviance from this and been given a multitude of different mini-games to play. In each scene throughout the game and bonus you will need to find a snow flake and a morph. Some of these had a good challenge and took me a while to find them. A hand does not hover over them, so thank you for this. At the end of the bonus game you can play the Ultimate HOP (my favourite), play the Mines Puzzle again (in easy, medium and hard modes), collect any snow flakes or morphs you may have missed or wanted to collect later in the game and replay any HOPs again that you want to get 3 stars for. All up the game took me about 7 hours to play and I thoroughly enjoyed it. Definitely comes recommended. There is plenty to do in each scene and I liked all the charactors to the story. Happy playing fishes. Rated 4 out of 5 by gramsx4 from A great game I found this game to be exciting and challenging. I would recommend this game. Rated 4 out of 5 by Granny_Gruff from For Today's Excercise, We Will Consider Diversity Once again we are in a world of its own, a future where Humans had almost destroyed the world and then, with the help of Elves, had restore some of the earth. Mr Hett is the relative elder of this future world. He is experienced in dealing with the Society, a privileged group that does not appreciate the people living below their tower in the remains of an earlier, more prosperous time. Tara and Lennart are two young people who try to assist Mr. Hett. Our story opens on a speech by Mr. Hett critical of recent moves by the Society. The Society retaliates by an attack of ice that leaves Lennart helping other locals to their homes and Tara trying to unfreeze Mr. Hett. A short time later, a second attack on Mr. Hett's home leaves the three friends to consider some solution. The two teens are told they need to travel to a mountain stronghold to find ancient Elven Magic that will help defeat the Society. As with all secrets, there is more to the mystery of the Stronghold than they know. Good stuff: Once again the striking artwork conjures up a future with homes built on the remains of modern civilization gone awry. With no stores or very much technology left to assist them, the people wear a variety of bits and pieces still usable. Dwellings are cobbled together from parts of buildings and vehicles and a water pump is the closest to modern conveniences they will get, barring remnants of electronic devices. The story is fairly clear, a privileged few wish to take the best there is and use whatever they want for their benefit, regardless of the detriment to the environment or other people. There is a more balanced number of HOPs and Puzzles than we've seen for a while. We have a "high tech" device that will freeze or heat any small item. We will complete a match three type puzzle for each use. There are morphing items in each scene and each HOP as well as snowflakes to collect in each scene among the CE bling. Bad stuff: It is hard to make the remnants of society and civilization "look pretty" and they don't. While Mr. Hett and the resurrected Elven Queen sound appropriately adult, the two teens sound like first graders. Bottom line: I like the story direction of this series. More grounded than a fairy tale, less techical than science fiction, it is easy to imagine a future when we will have to try to survive without so many things we take for granted. This is not the innovative game of the year, but a good solid endeavor that will afford you some enjoyable hours of game play. Play the Demo and read the reviews. You will see evidence of the spectrum of players that BFG is trying to serve. With so many different outlooks, you owe it to yourself to try before you buy. Not every game is for every player.